Of all the qualities that make the striped bass one of the country’s premier game fish—including its tremendous strength, its regal purple sheen and stately black stripes, and its ability to grow to large sizes—perhaps the best is the striper’s tendency to feed close to shore. The fish’s littoral nature means that even the shore-bound angler has the opportunity to hook a fish of 30-, 40-, or 50-plus pounds, but relatively few do. Not having a boat is not a valid excuse for not catching large stripers. Nor is living far from striper hot spots like Block Island, Montauk or Cape Cod. The striped bass migration routes brush by some of the most populated parts of the country, meaning that at some point during the season, fishermen between Virginia and Maine have large stripers swimming near their homes. The key to catching big striped bass lies not in having a boat or fishing in storied locations, but in understanding the striper’s habits, and learning as much as you can about the waters where they swim. If you’ve been pounding sand looking for cow bass without luck, one or all of following reasons may be standing between you and your trophy surf striper. 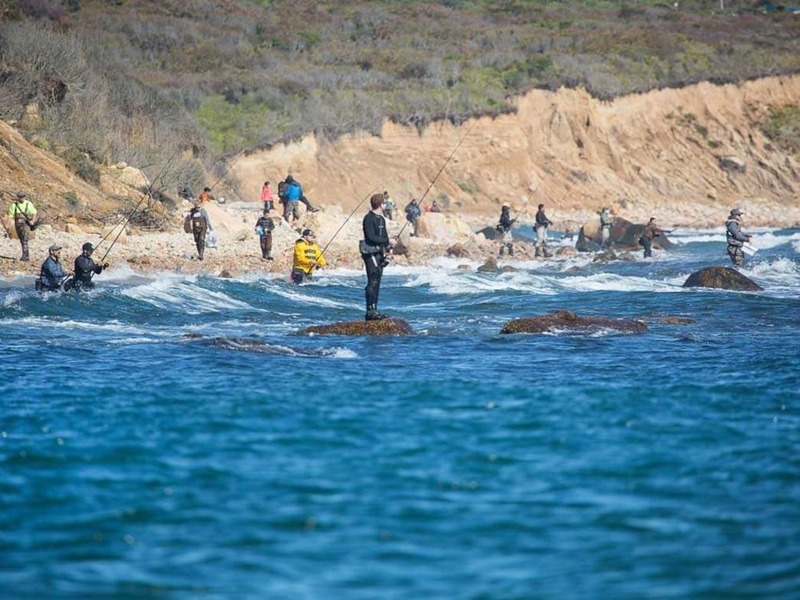 If your surfcasting is taking place during banker’s hours, you’re unlikely to encounter trophy striped bass. Of course, there are exceptions. A few times a season, usually during the spring or fall, schools of migrating stripers collide with schools of migrating baitfish, resulting in an all-out feeding frenzy in broad daylight. When you’re lucky, it happens within casting distance of shore. More often, however, big bass sulk in deep water when the sun is high, waiting for darkness to move into the shallows to hunt. Stripers feeding at night settle into a pattern. This makes them much easier to predict and the good fishing easier to replicate compared to sporadic daytime blitzes. Get comfortable with fishing at night, and become familiar with the areas you’re fishing during the day, so you know exactly where to cast when the lights go out. Frozen bait is convenient. You can store it indefinitely, use it over multiple trips, and it’s almost always available at your local bait and tackle shop. Unfortunately, if big stripers are your goal, you’re better off fishing lures than bait from the freezer. Whether it’s chunk bait like mackerel or bunker, or shelled bait like clams, the freezing and thawing process results in a bait that’s too soft to hold a hook, and lacks the scent that attracts big stripers. Most tackle shops supply fresh bait in season. You can call ahead to see when they get their shipments of surf clams or bunker, and even have them set aside some baits for you, if they’re likely to run out before you get there. Once you get the bait, you need to keep it fresh. This means keeping it cold, but avoiding direct contact with freshwater or ice. Using re-freezable ice blocks is one option, but it’s easier to place your baits in a zip-top freezer bag and then place that bag on ice. Fishermen dream of big stripers smashing up the surface to eat a topwater plug, but the biggest bass do the vast majority of feeding on the bottom. There, stripers find large, slow-moving meals like lobsters, crabs, tautog, and flounder. Even when hunting schools of large, surface-swimming baitfish like menhaden, big stripers will lurk near the bottom, picking off the wounded baits left behind by bluefish or smaller stripers. That means large bass are less likely to swim to the surface to attack a lure. For the best odds of getting a behemoth bass, you need to get your bait to where they spend most of their time. To do this, select lures that swim deep (See Reason #8), or add weight to your baits to make sure they are getting down. While most fishermen use 2- to 8-ounce sinkers when casting cut baits or clams, many fishermen fail to realize that adding a small egg sinker or rubber-core sinker to the leader above a live bait will help drag it down to the strike zone. Making that small adjustment may mean the difference between success and failure when fishing in current. 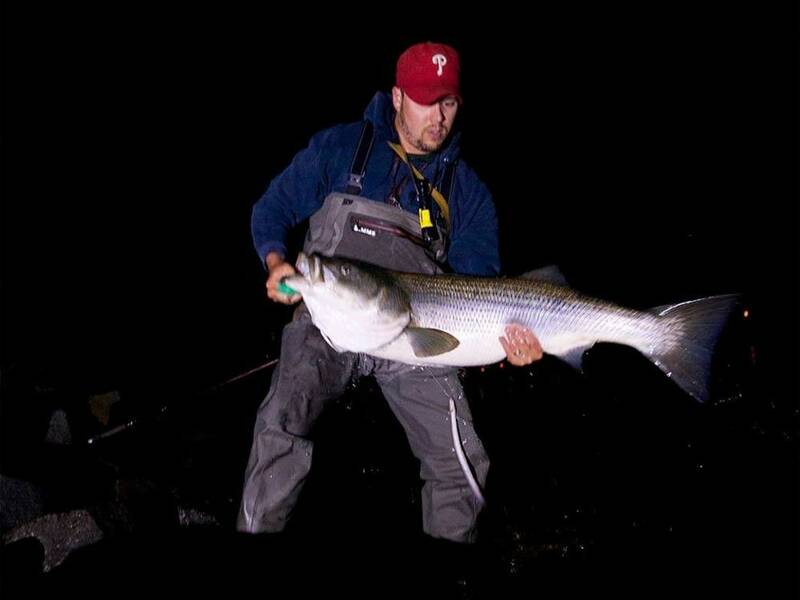 Culling through large numbers of small stripers is not a strategy for catching a big striper. Small stripers might as well be a different species from 25-plus-pounders. They eat different foods, live in different places, and feed at different times. Fishing for big stripers requires sacrificing quantity for quality. Each trophy striper caught in the surf is the culmination of many fishless nights. It requires faith that fishing big fish baits in places where big fish swim will eventually put a cow bass on the end of your line. Big fish get away more often than small fish. They straighten hooks, break lines, and swim around boulders and other structures. There are plenty of ways a big fish can escape that you have no control over, so it’s important that you don’t give it any more of an advantage than it already has. Keep your hooks sharp, and change them frequently. Set your drag tight, but not too tight. You want to put enough pressure on a fish to slow it down and turn it quickly, but not so much pressure that you break the line or bend out the hooks. Bent hooks make for great fish stories, but more of them are caused by a drag that’s too tight instead of an unstoppable fish. Check your knots and leader. If you catch a bluefish or a bunch of small stripers, run your fingers along your leader to check for nicks or abrasions. The smaller fish may not break a chafed leader, but a big one will. Talk with other anglers about when, where, and how they’re catching fish, and share your own intel, to get a better idea of what you’re doing wrong or right. A group of like-minded fishing buddies will help you learn about the areas and conditions that produce big fish faster than you could on your own. By sharing information and observations, you’ll have a larger pool of experience to draw from when trying to predict where and when big fish will show up. There are dozens of lures that will catch large striped bass, but for consistently fooling big fish, you need to have a selection of bucktails and needlefish. The simplest reason is because you can fish these lures with the most precision in the water column. An experienced angler can skim a thickly dressed bucktail jig or a slow-sinking needlefish just above the rocks and grass where big bass do their hunting (see Reason #3). Diving plugs may not get deep enough, and they definitely don’t spend as much time in the strike zone as a bucktail or needle. Both of these lures require a certain “feel” if you want to fish them well. They don’t thump or vibrate, like swimming plugs, and success may not come quickly. But stick with these lures, and they’re likely to become your top producers of large striped bass. The surfcasting Valhallas of Montauk and Cape Cod are well known for producing big striped bass, but most anglers are lucky to spend only a few days fishing these areas each year. I’ve known fishermen who put maximum effort into a single Montauk trip a year while overlooking the lesser-known waters close to their homes. After their Montauk trip ended, so too did their hopes of catching a trophy striper—but that shouldn’t be the case. Odds are, the waters closest to your home have a prime time or set of conditions when big stripers move in to feed. And, because they are closer to your house, you can fish these locations regularly enough to learn them in all of their “moods.” Record the details of each trip (see Reason #6) and eventually you’ll crack the code on what wind direction, tide, and time of year brings the bass to your doorstep. When you do, you’ll start passing on road trips to Montauk to fish the can’t-miss conditions in the surf close to home. However, knowing your home waters inside and out won’t help if you’re not using tackle and techniques suited for big fish (see Reason #4). I grew up fishing Cape May County in New Jersey, a stretch of shoreline much better known for weakfish and fluke than for big stripers. Most fishermen used light tackle and small lures, and as a result, most of the stripers caught were small. One fall, while still coming down from a great trip to Montauk, I tried the plugs and tactics that had been working for the bigger stripers at the end of Long Island. A funny thing happened: I started catching bigger stripers in South Jersey. That revelation extended my big fish opportunities far beyond my long weekend in Montauk. Unlocking the tricks to landing big stripers on your home waters improves your skill set for when you’re fishing unfamiliar territory. It doesn’t matter if you can fish every day, once a week, or once a month, if you are serious about catching a cow striper, you won’t let lousy weather or bad reports keep you from hitting the surf. There’s something to be learned from every outing, even the fishless ones. In fact, without the (welcome) distraction of catching fish, you’re more likely to observe how the water moves through the area. Fishing reports rarely tell the full story. Many times, schools of big fish move through an area unnoticed or unreported by the few anglers who find them. Even in this age of instant reports on social media, many surfcasters—at least the smart ones—still keep their secrets. The only way to get the full story is to get out there yourself, whenever you can. Written by Jimmy Fee for Field & Stream.